Three gated neighborhoods are nearing closeout in The Mesa, a popular Summerlin village conveniently located near the 215 Beltway at Russell Road and Hualapai Way in the master-planned community’s southern region. Three gated neighborhoods are nearing closeout in The Mesa, a Summerlin village near the 215 Beltway at Russell Road and Hualapai Way in the master-planned community’s southern region. Cielo by Woodside Homes offers four single-family home floor plans in both one- and two-story designs that span from 2,102 to 3,498 square feet and are priced from the mid-$400,000s. Monte Bello at Summerlin by Richmond American Homes has one- and two-story designs from 3,145 to 4,214 square feet starting from the $500,000s. Vista Dulce by Toll Brothers offers three two-story townhomes that range from 1,605 to 1,893 square feet and are priced from the low $300,000s. 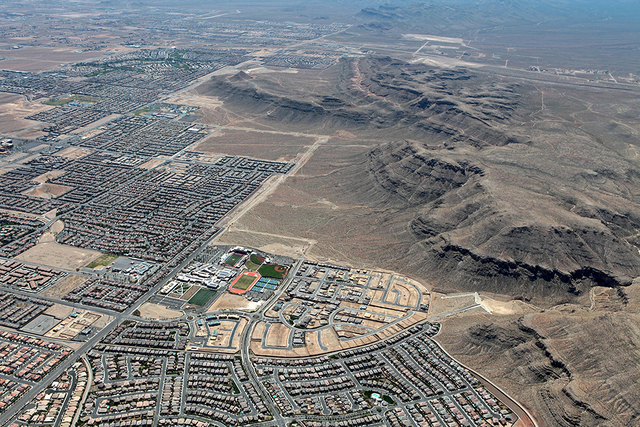 “It’s a great time to buy,” said Danielle Bisterfeldt, vice president of marketing, Summerlin. “The Mesa has easily been one of our best-selling villages, so now is the time to make the dream of living in Summerlin a reality. Combined, fewer than 40 residences remain in these three neighborhoods before The Mesa village is sold out. “Homes in these neighborhoods are designed and built by longtime Summerlin homebuilders who are known for quality and progressive designs that cater to today’s modern families,” she continued. “Plus, The Mesa’s highly desirable location nestled against the Spring Mountain ridgeline provides a picturesque backdrop, with no future development on the western border of this village. Homes in Cielo by Woodside Homes offer up to six bedrooms and four baths. Some designs provide the versatility of a bonus room or study that may be selected as an optional extra bedroom or casita. Cielo homes are designed with kitchens featuring granite countertops, large food-preparation islands, generous pantries and General Electric appliances. Outdoor living spaces include porches, loggias and courtyards, and they feature front yard water-conscious landscaping, and paver-stone driveways and walkways. Monte Bello at Summerlin by Richmond American Homes features spacious outdoor living areas, such as wide porches that create curb appeal in both single- and two-story designs with up to six bedrooms, four-and-one-half baths, and three-car garages. Monte Bello provides hundreds of available design options. Gourmet, professional kitchens, ideal for entertaining, come fully equipped with up to four ovens, dual dishwashers and granite-top islands. According to the Home Energy Rating System, Monte Bello homes are about 30 percent more energy efficient than the national new-home builder average. The Vista Dulce townhomes by Toll Brothers cater to homebuyers who want resident-exclusive amenities and the convenience of a townhome lifestyle. Vista Dulce offers three to five bedrooms, two-car garages, private backyards, fully maintained front yard landscaping, and access to the neighborhood’s state-of-the-art fitness center and resort-style pool. Floor plan features include foyers, drop zones between garage and kitchen, a second-floor laundry room, and an optional loft or fourth bedroom. Additional options include high-tech upgrades using the Control4 home automation web-based app, which is accessible from smartphones, computers and tablets. This allows homeowners to control remotely a number of home settings, including lights, exterior door locks, garage door access and thermostat settings.